With all the Southern Residents heading out to the ocean today, it was great news to hear that the T100s and T101s were in the area. 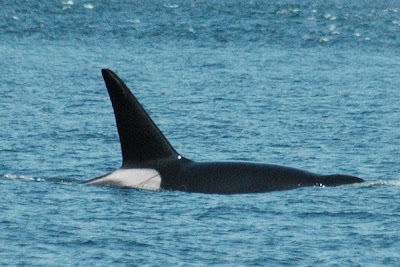 This afternoon we met up with T101, T102, T101A, and T101C near the coast of Lummi Island in Rosario Strait. While all transients have solid saddle patches, there are still some striking differences between them. 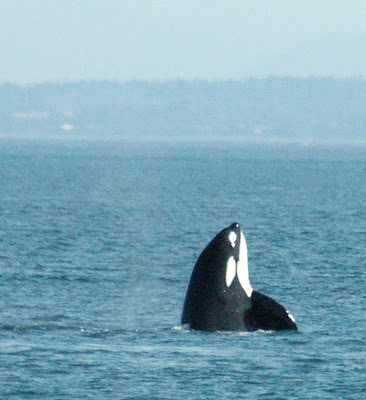 Many transients have distinct rakes or scratches, such as the big male T102. When you first see him, it looks almost like he's dragging a piece of kelp, but it's actually a thick black line across his saddle patch. I also saw my very first transient kill today. Female T101 and male T102 were apart from each other when all the sudden there was a bunch of splashing near T101, which looked just like what a harbor seal does this time of year when it's attracting a mate. T102 headed straight over to her, and soon after blood was visible in the water (I didn't see this part). Soon after, presumably after they finished eating, T101 did two spyhops and then two breaches.